Forearm supported in pronation with elbow in some flexion. Resistance 1kg women, 2kg men (1 litre of water = 1kg). 3 sets of 15 once daily. Increase resistance by 0.1 kg (100ml water) weekly. No comment was made regarding pain during exercise. Lift the weight by extending the wrist, then lower. The original research used a water container that is unavailable in North America. We have substituted a water bottle in a bag. 3 times a week, 4 weeks. Forearm supported in pronation with elbow extended. Wrist extended as high as possible then lowered into flexion slowly counting to 30, return to starting position using the other hand. 3 sets of 10, 1 minute rest between sets. Increase resistance when the exercise is pain-free. 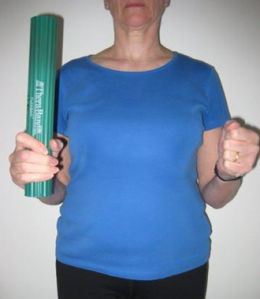 Exercise with mild pain. Stop if pain becomes disabling. Passive stretching of the extensor carpi radialis brevis tendon (ECRB) done by therapist 3 times before and 3 times after the eccentric exercise. Forearm pronated, elbow extended, wrist flexed and ulnar deviated. Hold 30-45 seconds. 30 second rest between stretches. Extend the wrist using the unaffected hand (2A). 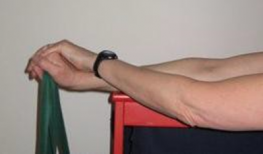 Allow the wrist to flex (eccentric contraction of wrist extensors) (2B). The original research used hand held weights. We have substituted a bag with weights. Forearm pronated, elbow and wrist extended. 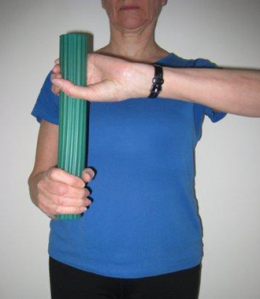 Allow wrist to flex slowly for approximately 4 seconds. 3 sets of 15 once daily. 30 second rest between sets. 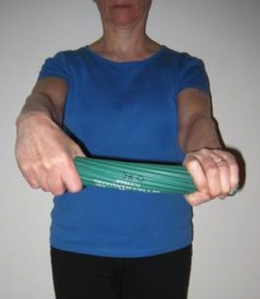 Increase resistance by using a thicker bar when the exercise is pain-free. Hold the bar in the affected hand (3A). Place the unaffected hand as shown (3B). 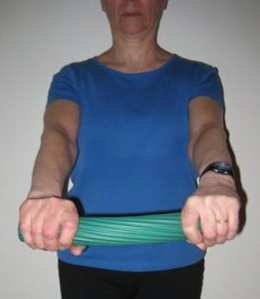 With affected wrist in full extension, twist the bar with the unaffected hand (3C). Stretch both arms out, elbows straight (3D). Slowly allow the affected wrist to bend, i.e. 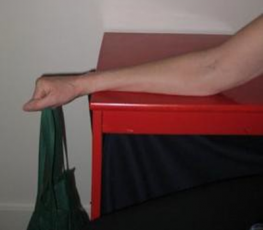 allow an eccentric contraction of wrist extensors (3E). 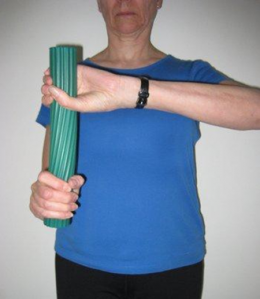 Developed by the BC Physical Therapy Tendinopathy Task Force: Dr. Joseph Anthony, Dr. Angela Fearon, Diana Hughes, Carol Kennedy, Dr. Alex Scott, Michael Yates, & Alison Hoens. A Physical Therapy Knowledge Broker project supported by: UBC Department of Physical Therapy, Physiotherapy Association of BC, Vancouver Coastal Research Institute and Providence Healthcare Research Institute. ↑ Peterson M, Butler S, Eriksson M, Svardsudd K. A randomized controlled trial of exercise versus wait-list in chronic tennis elbow (lateral epicondylosis). Uppsala Journal of Medical Science. 2011; 116: 269-279. ↑ Stasinopoulos D, Stasinopoulos I. (2006) Comparison of effects of cyriax physiotherapy, a supervised exercise programme and polarized polychromatic non-coherent light (bioptron light) for the treatment of lateral epicondylosis. Clinical Rehabilitation. 2006; 20(1): 12-23. ↑ Tyler T, Thomas G, Nicholas S, McHugh M. Addition of isolated wrist extensor eccentric exercise to standard treatment for chronic lateral epicondylosis: a prospective randomized trial. Journal Of Shoulder And Elbow Surgery. Sep 2010; 19(6): 917-922.